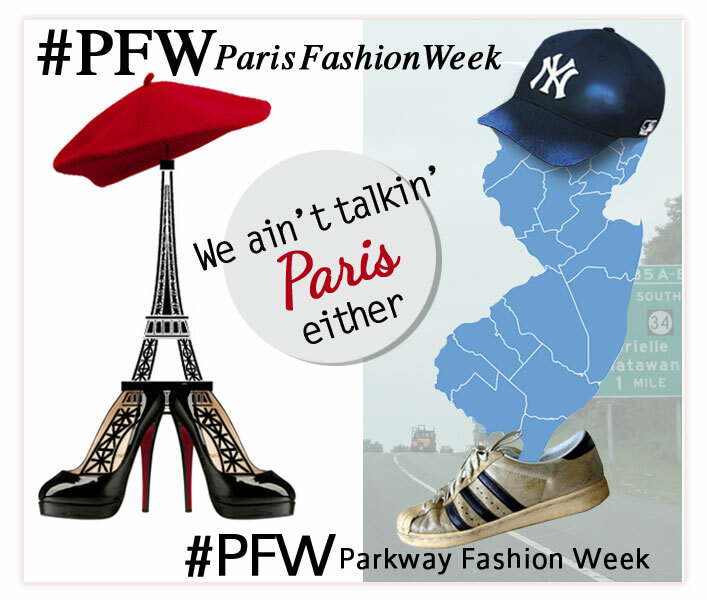 #PFW and We Ain’t Talkin’ PARIS Fashion Week! Paris Fashion Week is over concluding the Spring 2014 shows held around the world. I heard some buzz about another #PFW and set out eagerly to discover this hidden source for street-style chic. Apparently, a fashion connected friend of a friend made a pit-stop at a NJ Turnpike rest stop when she had an outer body fashion encounter. 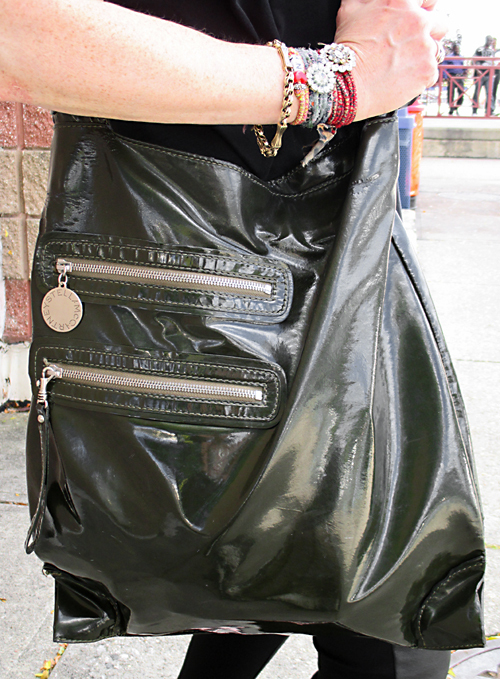 Out of the Starbuck’s exit, a fashion aware young man ran towards her screaming, “OMG, I LOVE YOUR BAG! 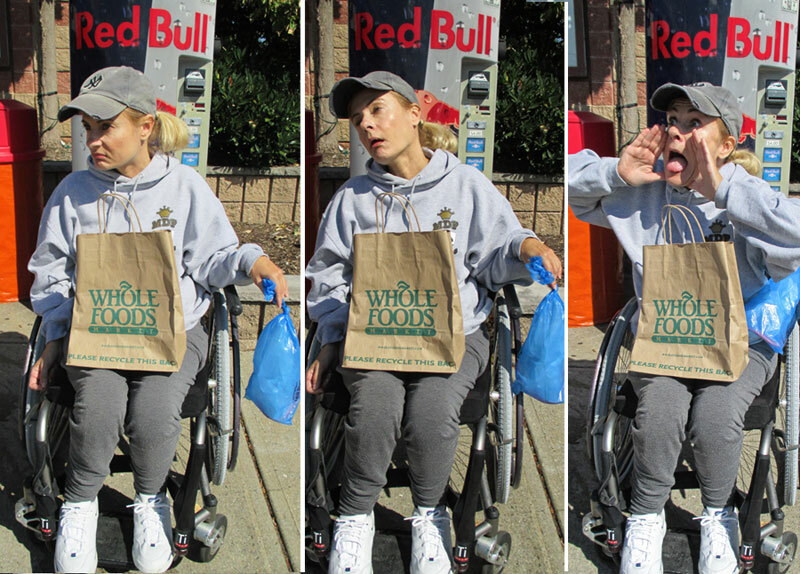 I LOVE STELLA!” He had sighted her discreetly logo’d Evergreen vegan Stella McCartney hobo. She was stunned by the recognition and all the more so on the JERSEY TURNPIKE! The fashion fellow further exclaimed, “Stella ROCKS ’cause of her animal awareness“. At that very moment, she had an epiphany and tweeted the fashion cognoscenti: NEW JERSEY rest stops ARE T-H-E next street-style frontier. Tip off The Sartorialist, Bill Cunningham, StyleBubble and the rest of the gang. It turns out that this friend of a friend has a reputation for being on the cusp. Oh my GAWD! It’s a STELLA! When I heard this story, I nearly rocked out of my chair. As a teen growing up in NJ, there was minus ZERO style. The “Garden State” is not known for fashion trends or street-style per se. With this trendy insider tip in mind, I planned to test the fashion waters myself at a Parkway NEW JERSEY REST STOP. Coverage of street-style trends in the rest stop and parking lot and a runway presentation by moi would be part of the event. This is my version of #PFW-Parkway Fashion Week. Since sweats and sneakers are my reference points for true Jersey style, I decided to take it up a notch with a fashionable designer interpretation. I mixed pattern and texture in true fashion blogger style. 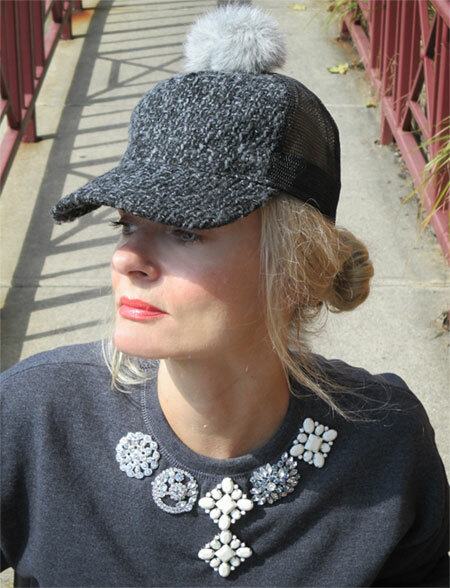 I styled my outfit with a tweed baseball cap from Target DIY’d with a fun heather grey pom pom, a brand new look from Jamie Kreitman’s brooch-laden, glam sweatshirt collection and python print pants tucked into pony polka dot booties by Opening Ceremony. The wheelchair ramp was tailor-made for the runway, creating the perfect venue for a catwalk photo-op. I call it “fashion rollway for the disabled”. S-a-s-h-a-y…C-h-a-n-t-é-é, S-a-s-h-a-y…C-h-a-n-t-é-é, boy, was this FUN! But the weary travelers didn’t break a smile except for a grizzled 18 wheel truck driver. He liked my hat’s pompom and cheered me on. So style is occasionally recognized by the least likely people in the most unlikely places. Several hours passed but I was not wowed by anyone’s sense of style. I was disappointed by the tip-off from the fashion insider. Was I missing something? Nevertheless, I soldiered on and came up with a few trends from #Parkway Fashion Week. I decided to visit the scene in the rest stop to see what was being sold at retail. The indoor market houses both mass and some class (Starbucks) with an apparel/accessory kiosk offering some slow lane fashion at fast lane prices. Sadly, fashion direction was difficult to detect. The only vaguely on pointe piece was an I Heart NY T-shirt which was distantly reminiscent of Phillip Lim’s “I Heart Nueva NY” tricked out t-shirt. The hi-low mix in the food court was comforting after a long day of fashion hunting. An extra tall Mocha Latté also helped to fortify my numbed senses. Just what I’ve always wanted, a cheap scarf with amorphous blobs of every color in the spectrum to match everything under the sun. OMG, is that a plastic Hermès inspired black tote beneath all this glory? I need one STAT! 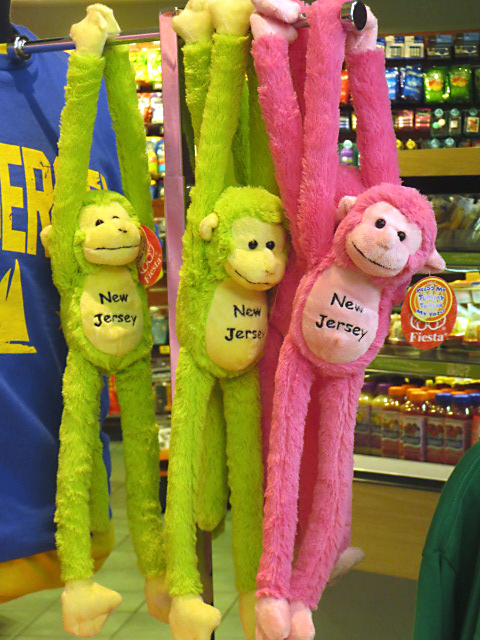 Just what I have always wanted, a tie-dyed monkey with New Jersey embroidered on its belly. I hit the jackpot when I found these neon lime and pink plush monkeys. What is with the monkeys? Are they indigenous to NJ? The appearance of the majority of Americans is slovenly. Are they all recovering from an extended camping trip at Yosemite or sacking out on their Costco couch (with side beverage attachment) after binge-watching a Glee marathon? How did this decline in personal care happen? 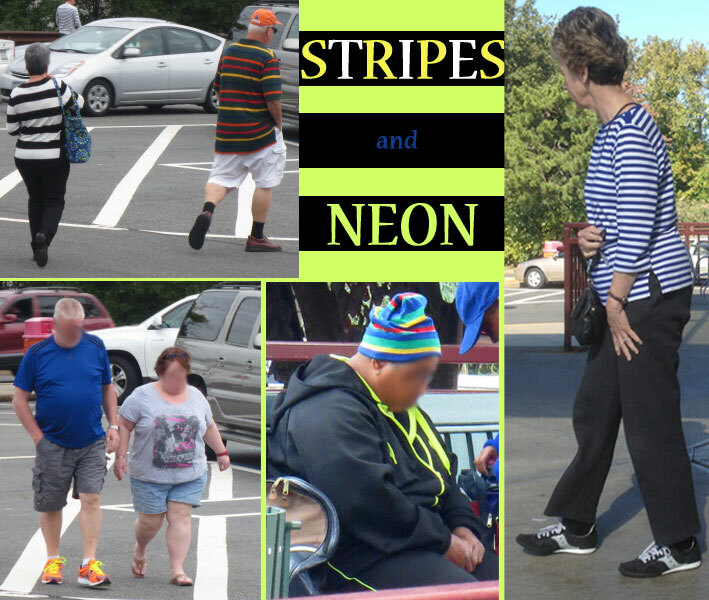 I am not alone in my indictment of American fashion. I found my kindred spirit, Professor Linda Przybyszewski of Notre Dame University, who teaches a class called “A Nation of Slobs.” CBS Sunday Morning focused on her singular mission to rescue the nation “from its own sloppiness” by introducing her students to fashion and the ritual of proper dress. Watch her in this segment. Now I understand why high end designers have joined in the fray, elevating casual attire to a Sport Luxe category along with the rest of their collections. I witnessed and now confirm that casual slovenly attire in America is a fait accompli. Heck, if you can’t win ’em join ’em. It’s also smart business strategy. How do I reconcile myself with this “sportif-trend”? Well, I found upscale designer sweatshirts, track pants, jackets and sneakers from au courant designers. You might gasp at the price tag, but the material, fit and workmanship justify the pricing. I especially love these Lanvin ponyskin and leather high top sneakers for $725. Give these designers credit for adapting to the realities of modern day dressing. Going beyond stilettos to a designer sneaker line is a wise way to expand their offerings. Even Balenciaga got into the sneaker act along with Isabel Marant who created style obsessions for comfortable and fashion credible sneakers. Just another example of how democratic fashion has become. Trends starting from the street percolating upwards to the designer level. BEFORE: Notice the anger in my face after having to dress down? I couldn’t take the humiliation so I popped a Zanax and became so sedated that I sat there like a cough drop for hours. I then realized I had to wake up, so I grabbed several Red Bulls from behind me, eventually woke up and then realized that Murphy the Retriever ran out into the parking lot after a Smart car coupe. I attempted to style my own sartorial take on NJ Parkway Rest Stop fashion. This is my interpretation of #Parkway Street-Style. I combined some worn, dingy sweatpants, a hoody from Mark Fineberg’s 2008 Bar Mitzvah, a family fave Yankee hat and good old white unscuffed sneakers. Hair and makeup were styled with a tightly pulled ponytail and an au naturel visage. Shopping at Whole Foods is a guilty pleasure and carrying a NY Times’ blue plastic bag for a Golden Retriever named Murphy, is de rigueur. HELP! I can’t rock this, I can’t roll this, I can’t go down this slippery slope. I refuse to dress down. It just doesn’t feel right. Lesson learned…a little effort goes a long way even at a New Jersey Parkway Rest Stop! I wanted to show you the icing on the “sweats cake” up close. Pull your hair back in a severe pony tail to the point where you will have a migraine, then thread it through the back opening and VOILA! you now fit in NJ. Written and styled in collaboration with Jamie Kreitman. Yowza. 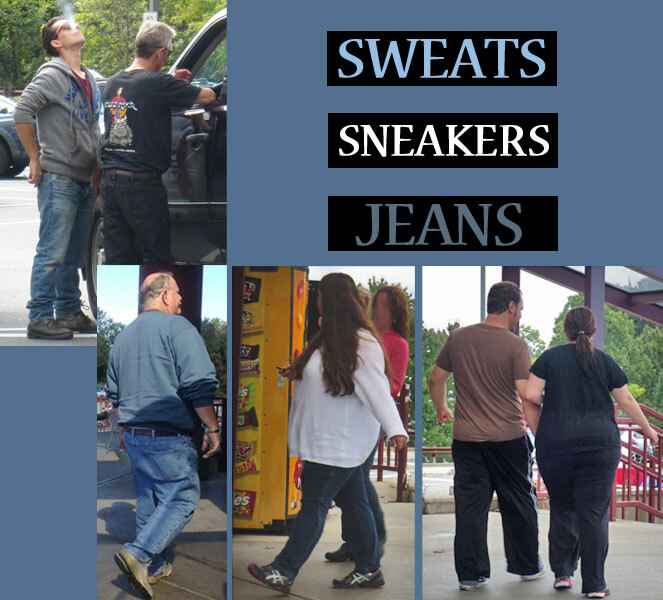 Of the twelve candid street style shots you showcased from the NJ turnpike rest stop, only two of the people were not overweight. It is not only the fashion in America that is in a sad state of affairs. Heart disease is the new black. Yup, only 2 didn’t look like candidates for Type-2 Diabetes. That is the reality. I think I need to design a tshirt line that says “Look at me, I have given up on life” and sell it at American rest stops. Should sell well I think.